Tutorial Tuesday: Making a Draw-string Baggie! Today’ tutorial is a brief walk through of how to make a draw-string baggie! I just learned it in my sewing class today (it’s the 2nd class, so I’m not very advanced). It’s super cute and easy to make, even if you don’t have a sewing machine. I didn’t feel comfortable recording video during class, so I don’t have any video footage to show you. So I will just have to talk you through what we did, with the help of some pictures. On the left is the finished product. You will need a rectangle piece of fabric (long side twice the length of the short side, so a 1:2 ratio), solid color or patterned, it’s really up to you. 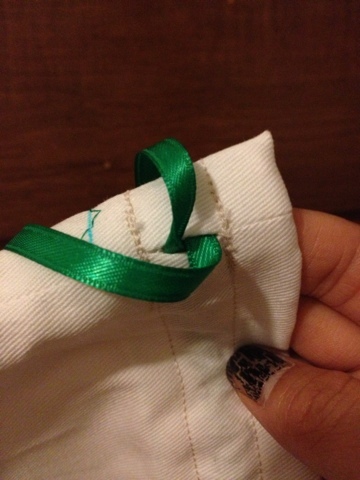 In class we were provided with white fabric and choice of ribbon (I chose green of course!). 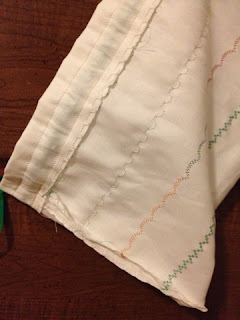 If you use a patterned piece of fabric then you won’t have to sew decorative stitches across like mine. For white or solid color fabric, and if you have a sewing machine with a variety of stitches, definitely sew some decorative stitches on. With rectangle piece of fabric, draw a line 3.5 inches from the top of the short side. 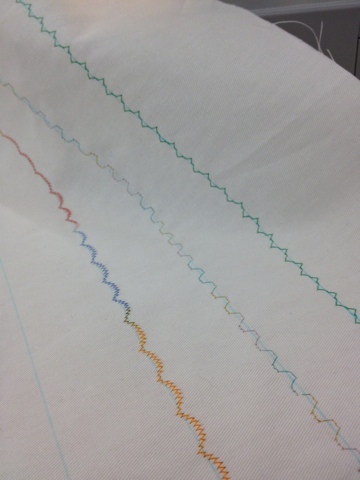 For horizontal stitching, we marked 3 more lines, below that line, each 1.5 inches down. The markings were made with markers that could easily be wiped off with a damp cloth. There are other markers that fade over time.Then sew the decorative stitches along those lines. You can see some of my decorative stitches on the left. From this point, you can leave your edges raw, or you can sew some zigzag stitching along the edges to keep them from fraying. 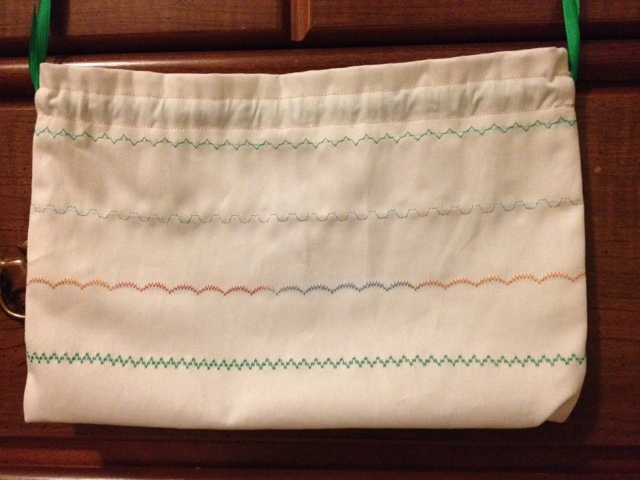 I sewed zigzags along all 4 sides of my rectangle piece. Then fold your rectangle up in half, wrong side out. Sew the two sides down with a straight stitch, leaving the top open. Next, still with the wrong side out, fold the top opening down to meet the 3.5″ line you drew (and/or sewed a decorative stitch). Pin and sew along that edge, then sew another round half an inch away from that towards the opening. This will create the path for your ribbon (observe image on the right). Turn your bag right side out now, and observe the sides where the stitching is. Between the two lines you made earlier, rip that bit of seam on each side using a seam ripper. This will create one opening on each side for your to slide your ribbon through. Cut two pieces of ribbon of the same length, and the length should be about 5-6 inches longer than the width of your baggie. If you don’t have one of those special sewing gadgets to snake the ribbon through the hole, you can use either a bobby pin (tie the ribbon on the folded part of the pin and use the other end to snake it through) or a long safety pin (pin down one end, close the pin and snake it through). For the first piece of ribbon, snake it in and out one end, so you make one full circle and come out the same place you came in (observe image on left). Then tie a knot to keep it from slipping out. Next, do the same for the second piece of ribbon but enter and exit from the other hole you created. That’s it! Your baggie is done! 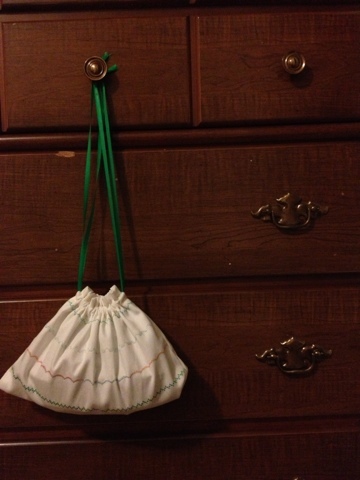 If you made it small,it can be a cute little coin bag, travel make-up bag or anything else you can think of. If you make it bigger, there are even more possibilities on the uses! If you decide to make one, please do share! Until next time! Previous Post Sunday Surprise: Making Sundaes! Hi there to every one, because I am really eager of reading this weblog’s post to be updated daily. It consists of pleasant stuff.